For other uses, see Eurasia (disambiguation). "Eurasian" redirects here. For people of mixed European and Asian ancestry, see Eurasian (mixed ancestry). Eurasia /jʊəˈreɪʒə/ is the combined continental landmass of Europe and Asia. The term is a portmanteau of its constituent continents (Europe and Asia). Located primarily in the Northern and Eastern Hemispheres, it is bordered by the Atlantic Ocean to the west, the Pacific Ocean to the east, the Arctic Ocean to the north, and by Africa, the Mediterranean Sea, and the Indian Ocean to the south. The division between Europe and Asia as two different continents is a historical social construct, with no clear physical separation between them; thus, in some parts of the world, Eurasia is recognized as the largest of the six, five, or even four continents on Earth. In geology, Eurasia is often considered as a single rigid megablock. However, the rigidity of Eurasia is debated based on paleomagnetic data. Eurasia covers around 55,000,000 square kilometres (21,000,000 sq mi), or around 36.2% of the Earth's total land area. The landmass contains well over 5 billion people, equating to approximately 70% of the human population. Humans first settled in Eurasia between 60,000 and 125,000 years ago. Some major islands, including Great Britain, Iceland, and Ireland, and those of Japan, the Philippines and Indonesia, are often included under the popular definition of Eurasia, in spite of being separate from the contiguous landmass. Physiographically, Eurasia is a single continent. The concepts of Europe and Asia as distinct continents date back to antiquity and their borders are geologically arbitrary. In ancient times the Black Sea and the Sea of Marmara, along with their associated straits, were seen as separating the continents, but today the Ural and Caucasus ranges are more seen as the main delimiters between the two. Eurasia is connected to Africa at the Suez Canal, and Eurasia is sometimes combined with Africa to make the largest contiguous landmass on Earth called Afro-Eurasia. Due to the vast landmass and differences in latitude, Eurasia exhibits all types of climate under the Köppen classification, including the harshest types of hot and cold temperatures, high and low precipitation and various types of ecosystems. Eurasia formed 375 to 325 million years ago with the merging of Siberia, Kazakhstania, and Baltica, which was joined to Laurentia, now North America, to form Euramerica. Chinese cratons collided with Siberia's southern coast. Eurasia has been the host of many ancient civilizations, including those based in Mesopotamia, the Indus Valley and China. In the Axial Age (mid-first millennium BC), a continuous belt of civilizations stretched through the Eurasian subtropical zone from the Atlantic to the Pacific. This belt became the mainstream of world history for two millennia. At the moment one of the most prominent projects of the European Union (EU) is the Russia - EU Four Common Spaces Initiative. However, no significant progress was made and the project was put on hold after Russia-EU relations deteriorated after the crisis in Ukraine. An economic union of former Soviet states named the Eurasian Economic Union was established in 2015, similar in concept to the EU. The Russian concept of “Eurasia” corresponded initially more or less to the land area of Imperial Russia in 1914, including parts of Eastern Europe. One of Russia's main geopolitical interests lies in ever closer integration with those countries that it considers part of “Eurasia.” This concept is further integrated with communist eschatology by author Alexander Dugin as the guiding principle of "self-sufficiency of a large space" during expansion. Every two years since 1996 a meeting of most Asian and European countries is organised as the Asia–Europe Meeting (ASEM). The term Eurasia gained geopolitical reputation as one of the three superstates in 1984,  George Orwell's novel where constant surveillance and propaganda are strategic elements (introduced as reflexive antagonists) of the heterogeneous dispositif such metapolitical constructs use in order to control and exercise power. In ancient times, the Greeks classified Europe (derived from the mythological Phoenician princess Europa) and Asia (derived from Asia, a woman in Greek mythology) as separate "lands". Where to draw the dividing line between the two regions is still a matter of discussion. Especially whether the Kuma-Manych Depression or the Caucasus Mountains form the southeast boundary is disputed, since Mount Elbrus would be part of Europe in the latter case, making it (and not Mont Blanc) Europe's highest mountain. Most accepted is probably the boundary as defined by Philip Johan von Strahlenberg in the 18th century. He defined the dividing line along the Aegean Sea, Dardanelles, Sea of Marmara, Bosporus, Black Sea, Kuma–Manych Depression, Caspian Sea, Ural River, and Ural Mountains. In modern usage, the term "Eurasian" is a demonym usually meaning "of or relating to Eurasia" or "a native or inhabitant of Eurasia". The term "Eurasian" is also used to describe people of combined "Asian" and "European" descent. West or western Eurasia is a loose geographic definition used in some disciplines, such as genetics or anthropology, to refer to the region inhabited by the relatively homogeneous population of West Asia and Europe. The people of this region are sometimes described collectively as West or Western Eurasians. Located primarily in the eastern and northern hemispheres, Eurasia is considered a supercontinent, part of the supercontinent of Afro-Eurasia or simply a continent in its own right. In plate tectonics, the Eurasian Plate includes Europe and most of Asia but not the Indian subcontinent, the Arabian Peninsula or the area of the Russian Far East east of the Chersky Range. Nineteenth-century Russian philosopher Nikolai Danilevsky defined Eurasia as an entity separate from Europe and Asia, bounded by the Himalayas, the Caucasus, the Alps, the Arctic, the Pacific, the Atlantic, the Mediterranean, the Black Sea and the Caspian Sea, a definition that has been influential in Russia and other parts of the former Soviet Union. Nowadays, partly inspired by this usage, the term Eurasia is sometimes used to refer to the post-Soviet space – in particular Russia, the Central Asian republics, and the Transcaucasian republics – and sometimes also adjacent regions such as Turkey, Mongolia, Afghanistan and Xinjiang. This usage can be seen in the names of Eurasianet, The Journal of Eurasian Studies, and the Association for Slavic, East European, and Eurasian Studies, as well as the titles of numerous academic programmes at US universities. Another prominent example of this usage is in the name of the Eurasian Economic Community, an organization including Kazakhstan, Russia, and some of their neighbors, and headquartered in Moscow, Russia, and Astana, the capital of Kazakhstan. The word "Eurasia" is often used in Kazakhstan to describe its location. Numerous Kazakh institutions have the term in their names, like the L. N. Gumilev Eurasian National University (Kazakh: Л. Н. Гумилёв атындағы Еуразия Ұлттық университеті; Russian: Евразийский Национальный университет имени Л. Н. Гумилёва) (Lev Gumilev's Eurasianism ideas having been popularized in Kazakhstan by Olzhas Suleimenov), the Eurasian Media Forum, the Eurasian Cultural Foundation (Russian: Евразийский фонд культуры), the Eurasian Development Bank (Russian: Евразийский банк развития), and the Eurasian Bank. In 2007 Kazakhstan's President, Nursultan Nazarbayev, proposed building a "Eurasia Canal" to connect the Caspian Sea and the Black Sea via Russia's Kuma-Manych Depression in order to provide Kazakhstan and other Caspian-basin countries with a more efficient path to the ocean than the existing Volga-Don Canal. This usage is comparable to how Americans use "Western Hemisphere" to describe concepts and organizations dealing with the Americas (e.g., Council on Hemispheric Affairs, Western Hemisphere Institute for Security Cooperation). Laurasia, a geological supercontinent joining Eurasia and North America. Marmaray, railway tunnel links the Europe to Asia. Wikivoyage has a travel guide for Eurasia. Look up eurasia in Wiktionary, the free dictionary. 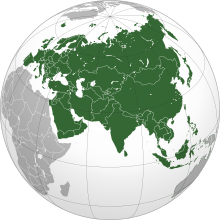 Wikimedia Commons has media related to Eurasia. ^ "Population of Europe (2018) - Worldometers". www.worldometers.info. Retrieved 30 March 2018. ^ "Population of Asia (2018) - Worldometers". www.worldometers.info. Retrieved 30 March 2018. ^ Nield, Ted. "Continental Divide". Geological Society. Retrieved 8 August 2012. ^ a b c "How many continents are there?". National Geographic Society. Retrieved 27 July 2017. By convention there are seven continents: Asia, Africa, North America, South America, Europe, Australia, and Antarctica. Some geographers list only six continents, combining Europe and Asia into Eurasia. In parts of the world, students learn that there are just five continents: Eurasia, Australia (Oceania), Africa, Antarctica, and the Americas. ^ "What is Eurasia?". geography.about.com. Retrieved 17 December 2012. ^ Pavlov, V.E. (2012). "Siberian Paleomagnetic Data and the Problem of Rigidity of the Northern Eurasian Continent in the Post Paleozoic". Izvestiya, Physics of the Solid Earth. 48 (9–10): 721–737. doi:10.1134/S1069351312080022. ^ Li, Yong-Xiang; Shu, Liangshu; Wen, Bin; Yang, Zhenyu; Ali, Jason R. (1 September 2013). "Magnetic inclination shallowing problem and the issue of Eurasia's rigidity: insights following a palaeomagnetic study of upper Cretaceous basalts and redbeds from SE China". Geophysical Journal International. 194 (3): 1374–1389. doi:10.1093/gji/ggt181. ISSN 0956-540X. ^ R. W. McColl, ed. (2005). 'continents' – Encyclopedia of World Geography, Volume 1. Golson Books Ltd. p. 215. ISBN 9780816072293. Retrieved 26 June 2012. And since Africa and Asia are connected at the Suez Peninsula, Europe, Africa, and Asia are sometimes combined as Afro-Eurasia or Eurafrasia. ^ Andreen, Finn (15 April 2014). "The Concept of Eurasia". Blogger.com /. Comment and Outlook. Retrieved 6 June 2014. ^ Brzezinski, Zbigniew (1997). The grand chessboard : American primacy and its geostrategic imperatives ([Repr.] ed.). New York, NY: Basic Books. p. 31. ISBN 978-0465027262. ^ Nartov, N. A. (2004). Geopolitika : [učebnik] (3rd ed.). Moskva: Edinstvo. Part 2.4, p. 50. ISBN 978-5238006826. ^ Andreen, Finn. "The Concept of Euroasia". Blogger.com. Commentary and Outlook. Retrieved 6 June 2014. ^ Dugin, Alexander (21 March 2017). "Eurasia: A Special Worldview". The Fourth Political Theory. Retrieved 30 April 2017. ^ Tovy, Tal (2015). The changing nature of geostrategy, 1900-2000: the evolution of a new paradigm (PDF). Maxwell Air Force Base, Alabama: Air University Press. Air Force Research Institute. p. 19. ISBN 978-1-58566-253-1. ^ Porter, Patrick (27 February 2012). "The Maps are Too Small: Geography, Strategy and the National Interest". Foreign & Commonwealth Office. Government Digital Service. Retrieved 8 March 2019. ^ Ingram, Alan (2017). "Art, Geopolitics and Metapolitics at Tate Galleries London" (PDF). Geopolitics. 22 (3). doi:10.1080/14650045.2016.1263186. ^ "Pangaea Supercontinent". Geology.com. Retrieved 19 February 2011. ^ Schmidt, Matthew (2005). "Is Putin Pursuing a Policy of Eurasianism?". Demokratizatsiya. 1 (13): 90. ^ "Eurasianet". Retrieved 13 March 2017. ^ Journal of Eurasian Studies. Elsevier. Retrieved 13 March 2017. ^ "About ASEEES". Association for Slavic, East European, and Eurasian Studies. Retrieved 13 March 2017. ^ "Slavic and Eurasian Studies". Duke Graduate School. Retrieved 13 March 2017. ^ "Russian and Eurasian Studies". George Mason University. Retrieved 13 March 2017. ^ "Department of Slavic and Eurasian Studies". University of Texas at Austin. Retrieved 13 March 2017. ^ "Center for Russian, East European and Eurasian Studies". Stanford University. Retrieved 13 March 2017. ^ "Institute of Slavic, East European and Eurasian Studies". University of California, Berkeley. Retrieved 13 March 2017. ^ "L. N. Gumilyov Eurasian National University". Emu.kz. 29 July 2010. Retrieved 7 August 2010. ^ "The Eurasian Media Forum". Eamedia.org. Retrieved 7 August 2010. ^ "Eurasian Development Bank". Eabr.org. Archived from the original on 24 May 2010. Retrieved 7 August 2010. ^ "Eurasian Bank". Eurasian-bank.kz. Retrieved 7 August 2010.